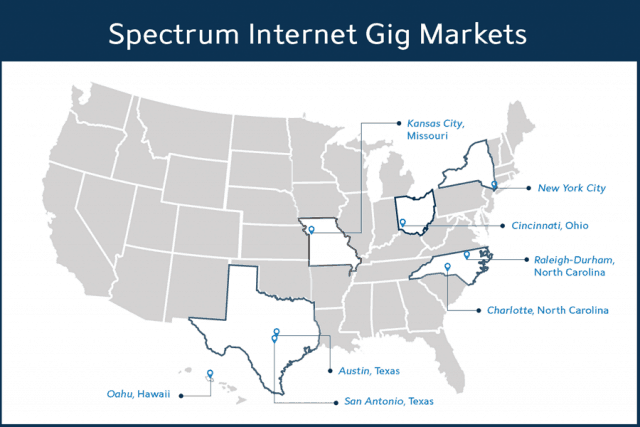 Spectrum markets where gigabit speed is already available. Charter Communications is accelerating the deployment of the next generation cable broadband standard DOCSIS 3.1 so that it can offer almost every customer gigabit download speed by the end of this year. Charter’s biggest challenge is expected to be swapping legacy modems inadequate for the task of delivering 200 Mbps and higher speeds to residential customers. Many Charter customers are still using modems originally provided by Time Warner Cable and Bright House Networks, generally considered adequate for supporting top speeds only between 50-100 Mbps. But Charter is planning to offer faster internet speeds to position itself as a viable broadband competitor in markets where fiber competitors have poached subscribers and the future threat of 5G speeds up to 1 Gbps are on the horizon. That could require a substantial modem exchange program, especially in cities that were never upgraded to Time Warner Cable Maxx before Charter acquired Time Warner Cable. In 2017, Charter intentionally focused most of its time and money integrating its acquired Time Warner Cable and Bright House Networks customers into Charter’s billing, provisioning, service, and retention systems. This came, Rutledge admitted, at the expense of long-time Charter customers who saw new product launches and upgrades delayed because of the ongoing integration effort. It will take until 2019 to fully integrate all of Charter’s customers onto a single platform that will no longer distinguish if a customer was a long-standing Charter customer or a former TWC or BH subscriber. Customers willing to abandon their legacy Time Warner Cable or Bright House plans in favor of a Spectrum plan are also dragging their feet. As of the end of 2017, 51% of TWC and Bright House customers were still sticking with their original plan, refusing to switch to Spectrum pricing and packaging. As customers face Spectrum’s new plans, some are canceling service. Time Warner Cable residential video customers dropped by 2.5% over 2017. Charter Legacy customers dropped by 1%, while legacy Bright House customers declined by 0.5%. Legacy Charter areas saw subscribers running out of patience. The company lost 10,000 video customers in the last quarter versus a gain of 20,000 customers a year ago. Company officials blame the complications associated with absorbing millions of acquired customers for the results. “In 2016 and 2017, we delayed a number of new product launches through the integration, particularly at legacy Charter within our fundamental structured operating model and business rules now in place, we will more aggressively launch new products nationwide,” said Rutledge. Charter is also spending a considerable amount of its financial resources buying back its stock. During the fourth quarter, Charter accelerated its buyback program repurchasing 13.5 million shares in Charter Holdings stock totaling $4.7 billion at an average price of $347 per share. For all of 2017, Charter bought back $13.2 billion worth of its own stock. 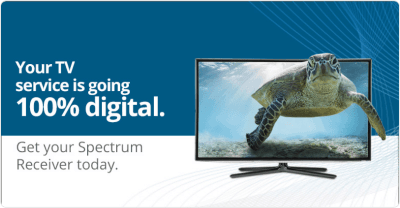 Charter did not restart its digital television conversion program until June of 2017, and 30% of Time Warner Cable and 50% of Bright House Networks customers are still watching analog cable television as a result. Company officials promise digital conversion will be completed nationwide by the end of this year, the first step the company will take to make dramatic broadband speed increases possible. Among the most significant improvements is the introduction of the Worldbox set-top box, which will be available nationwide by the end of 2018, but generally only to new video customers. The new box runs faster and is less expensive than the traditional set-top box, and better integrates on-demand and streaming video services. Worldbox will also highlight Spectrum’s new Spectrum Guide, an improved on-screen program guide and content portal. The new guide will also include support for third-party streaming services like Netflix. Charter has also begun to deploy an improved Wi-Fi router known as Wave 2, which claims to offer faster speeds and better signals throughout a customer’s home. Availability is reportedly spotty, but improving. Credit where credit is due: I can hit nearly 800 Mbps over wireless with my MacBook Pro (a late 2013 model) using the ISP-provided router. Wired is still faster of course, and most non-Mac laptops have 2×2 11ac radios sp speeds will be around 500-550 Mbps, but competition from fiber providers means the ISP is actually trying to provide service as well as they can, despite being saddled with cable plant that takes some doing to upgrade. Will probably be $2-300 after the “Promotional Rate” expires. The problem with Spectrum’s 1gig package is the upload is only 35mbits. Definitely awesome that they are expanding it out across the country but they need to up that number that for areas that already have fiber service with higher upload. Just got a free upgrade to 10/100 two days ago here in Minnesota. Of course, I was never notified of the upgrade. I only found out the service was available when I went to look at my bill online and they were advertising speeds “starting at 100 Mbps”, so I called. A speed test has me at 11/111 Mbps. The highest service offered in my area is 10/120 Mbps for and extra $25/month, but I’m already getting 11/111 Mbps, so paying an extra $25 for 120 Mbps seemed silly. Here in West Michigan I had to call Spectrum (Charter) to get my download speed raised … my latest test using an Ethernet cable directly to the modem was 93 mps download, but still a very pokey 5.5mps upload. I was told it would take to the end of the year to get up to the 10 mps. Very sad news, because my video security system can’t stream properly at that slow of an upload speed. ANYONE WANNA BET THAT WILL HAPPEN? Can I still use the same wifi router they gave me? I’m going to get the Netgear but it says I need a router to get WiFi so what do I do?